The Tsubotsubo-dana is constructed of two shelves and four legs and is one of, if not the most colorful tana used in the Urasenke school. 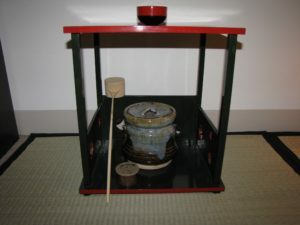 This tana is finished in dark green lacquer and the edges of the shelves as well as the carved tsubo emblems that adorn the koshiita are trimmed in tsumagure, a muted red lacquer. Both the Tsubotsubo-dana and the Yoshino-dana konomi of the 13th iemoto Ennosai, are used in the same manner, the only exception being the placement of the hishaku at the end of the temae. The mizusashi is placed on the bottom shelf while the usuchaki is placed on the top shelf at the start of the temae. The image at the top shows the display at the end of the temae. Note the placement of the hishaku on the back koshiita.